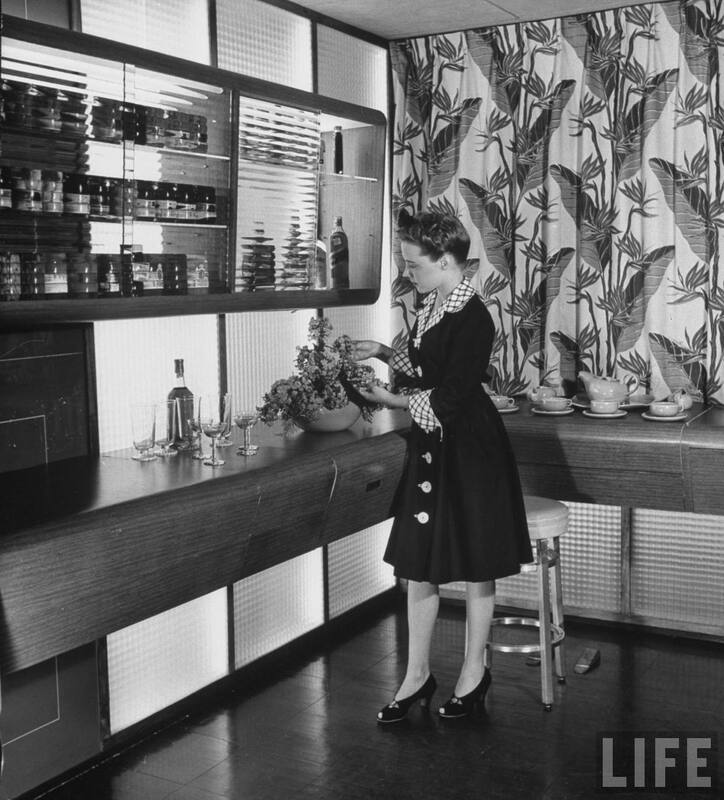 The look of the American kitchen in the 1930s and early 1940s was very different than the shape it had taken in the postwar years. Both the kitchen and the bathroom were styled in streamlining forms, and provided complementary setting for the streamlined appliances invented in this decade. 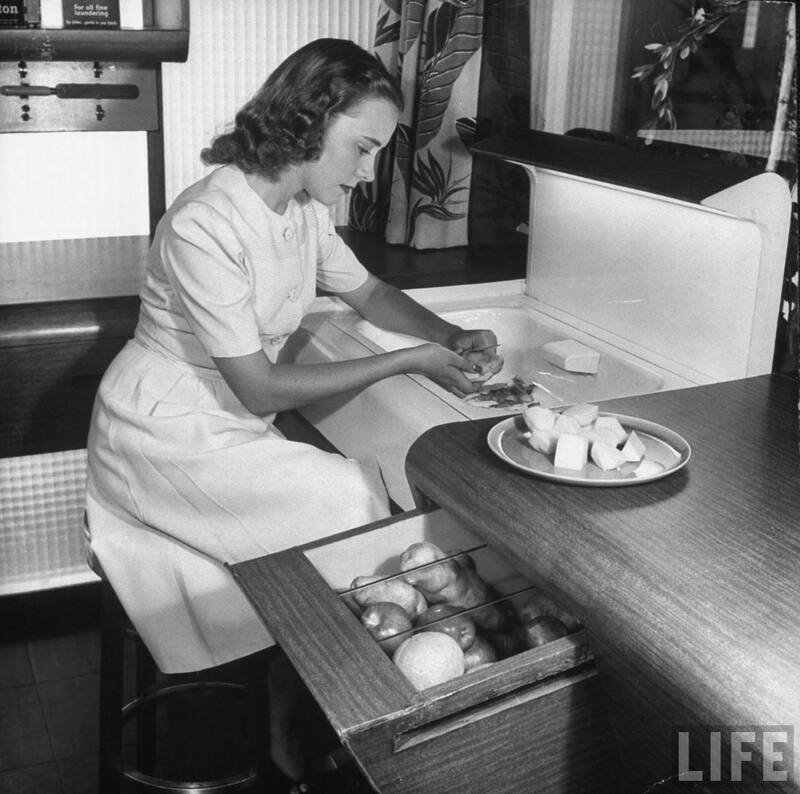 The modernized kitchen and bath became the domestic status symbols, where the housewife exercised her taste and power when determining the look of the rooms and the choice of appliances. 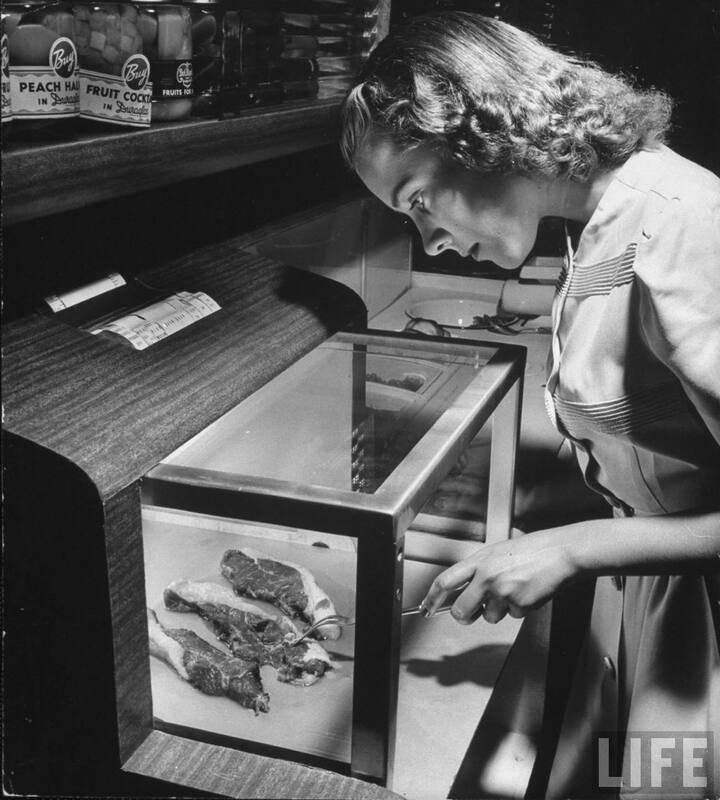 Here are a couple of images from the story LIFE magazine ran in 1943 about the Kitchen of Tomorrow exhibit presented in Toledo, Ohio. 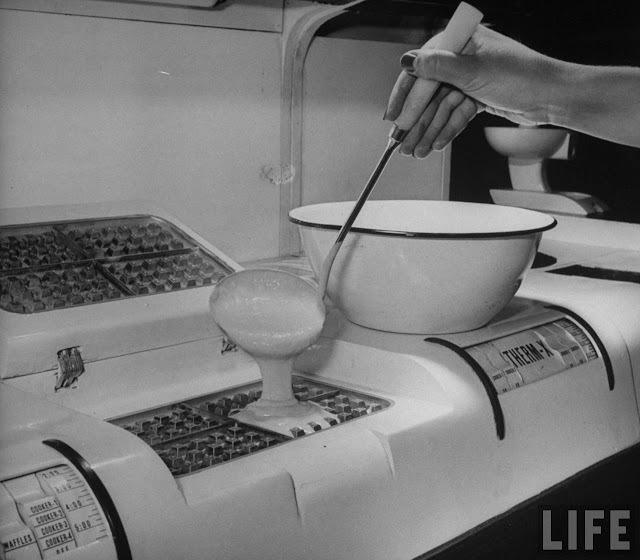 The kitchen, complete with built-in pots and pans, was designed by the Libbey-Owens-Ford Glass Company to help housewives commander their households. 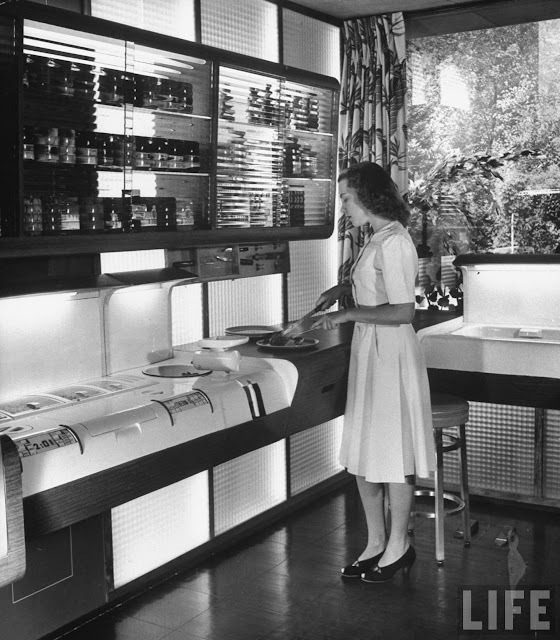 When not in use, cooking surfaces, sink pots, pans and all of the equipment disappear in this ultramodern kitchen. Uniform lids come down over the work units and make a handy bar. Kitchen in use looks like this. 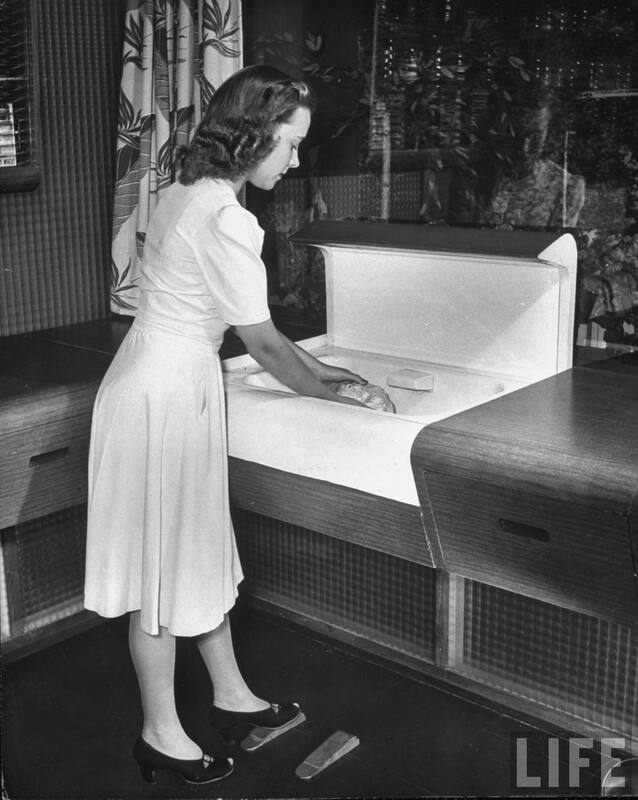 Here the sink, meat chopper and cooking units, under the lids at the left, are visible. Head and shins can’t be bumped on cabinet doors because they slide. Potatoes are pared in sink. Electric garbage unit grinds parings. 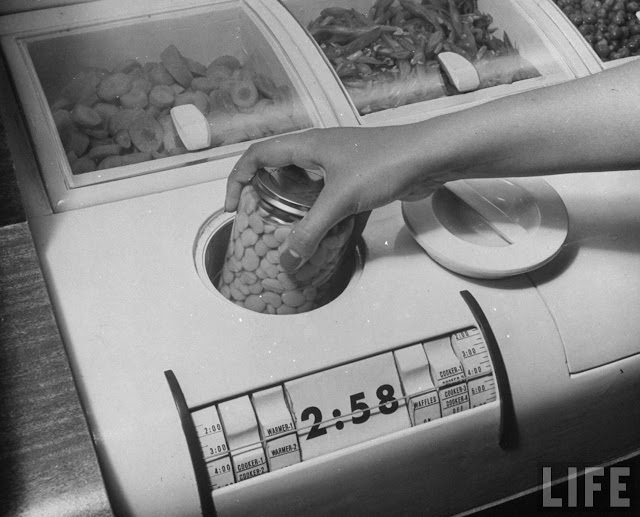 Vegetable drawer tilts so contents roll forward. This is the sink. 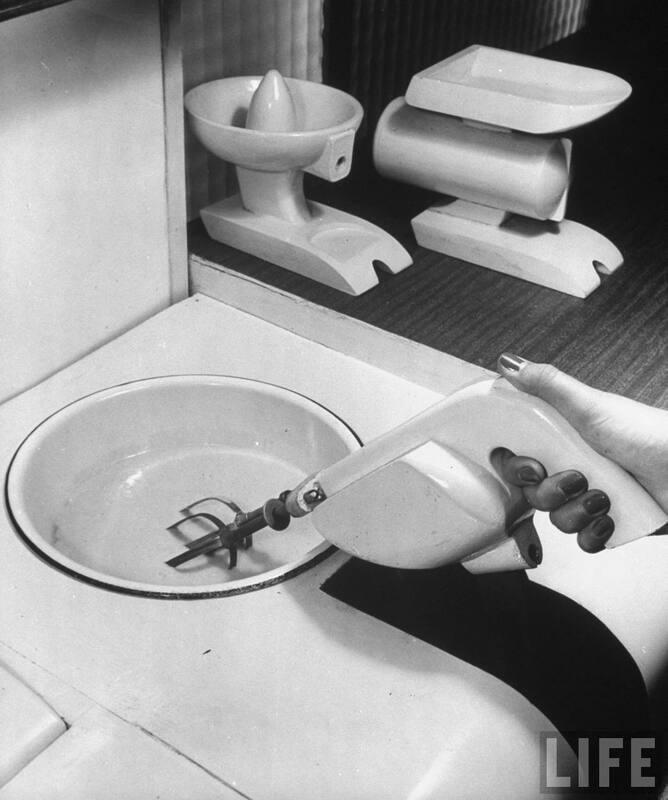 Faucet handles, which are a great hazard to dishes and china, have been eliminated. Water is controlled by foot pedals. Frying can be done in the oven by substituting aluminum plate for grill. Another oven gadget is motor-driven barbecue spit. Sides and top of glass seal the heat in. Small utensils, such as kitchen knives, spoons, cooking forks, instead of lying scattered around a drawer are safely tucked away in panels hinged under wall cabinets. Waffle iron is built in at the front of the cooking unit. A griddle or small pan fryer can be substituted for it. Temperature in all the units is automatically controlled. Mixing unit, fruit juicer and meat grinder can all be attached here. Handle above which fits into the slot, provides the power to operate any one of these appliances. Built-in toaster is at the rear. Beside it is one of several glass cooking units. 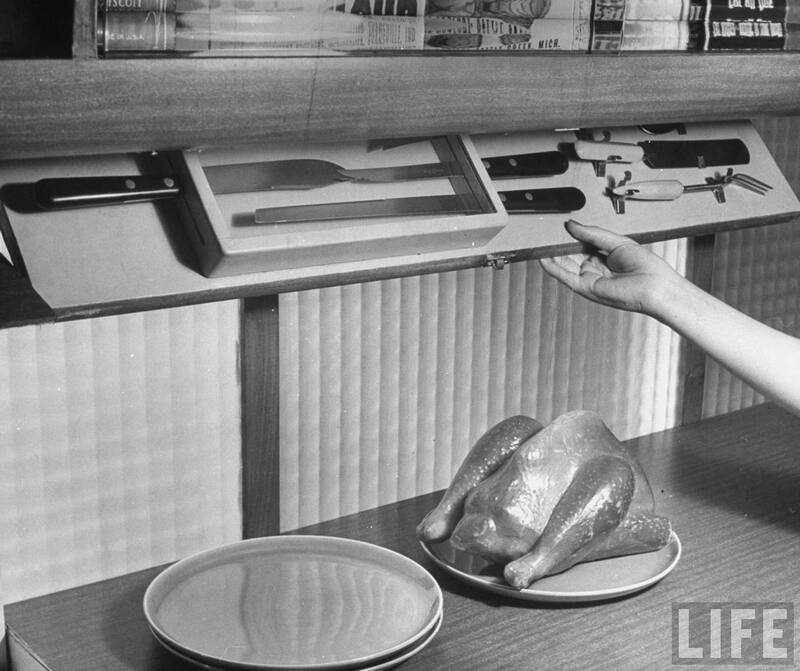 Each can be replaced by a shallow baking pan and unit can serve as an oven. 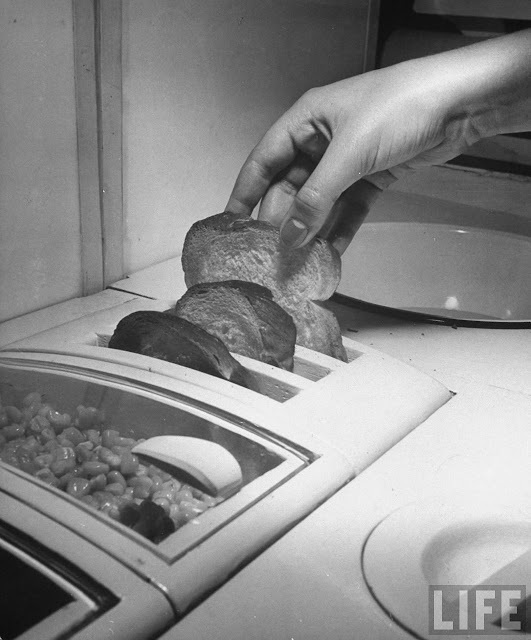 Pre-cooked foods can be heated in their own containers thus saving pot-washing. Standard-size cans fit into circular units which can be heated as desired.